KUZU TANDIR is a popular lamb dish in Turkish cuisine. The traditional way to cook lamb shanks is to hook them over coals for hours in a “tandır”, a special oven made from a pit in the ground. In Turkey, many places still cook the lamb in this traditional way, but at home, Kuzu Tandir is usually cooked on the stove or in the oven and served with Turkish Bulgur pilaf or mashed potatoes. 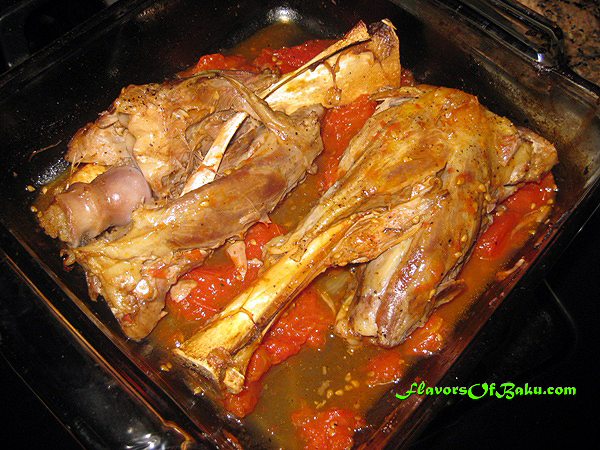 Lamb shanks come from the lower section of the lamb’s leg. 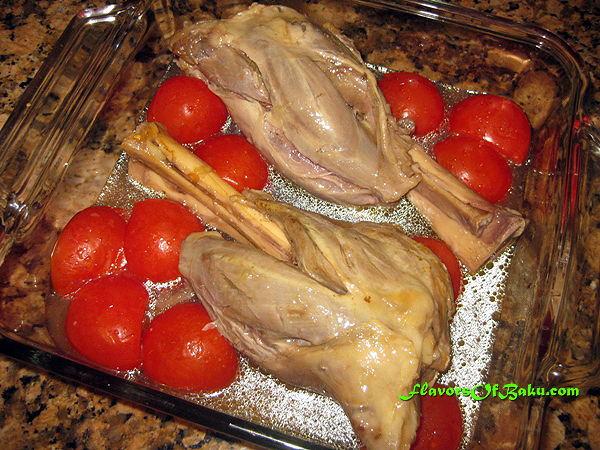 Because of its texture, a lamb shank needs to be boiled, steamed, or roasted for a long time before it’s fully cooked. 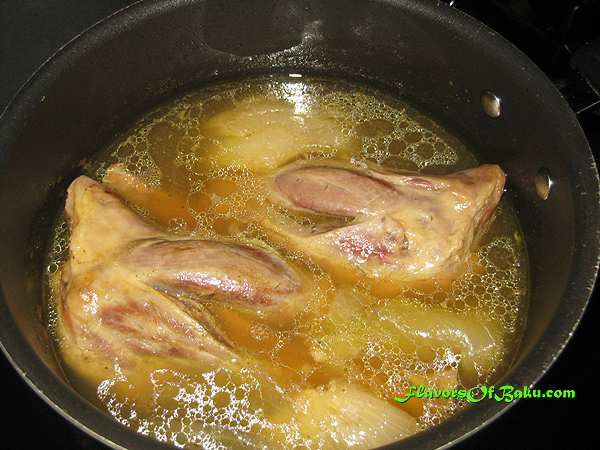 Rinse the shanks with cool water and place them in a small pot. Add water until the shanks are fully submerged and bring it to a boil. As it comes to a boil, skim the foam off the top. Place the onion in the pot, then add salt, pepper, and turmeric. Reduce the heat to low and simmer the lamb for about one hour or until the meat is halfway cooked. Remove the shanks from the broth and place them in a baking pan. Cut the tomatoes into pieces (or use tomato sauce) and arrange them around the meat. Add ½ cup of lamb stock and 1 teaspoon of lemon juice. Cook uncovered for about one hour or until lamb is cooked through and falling off the bone. Don’t forget to turn shanks over from time to time during the cooking process (they’ll get dry otherwise). After the shanks are done cooking and meat is tender, cover the pan with foil and let it rest for 5-10 minutes. 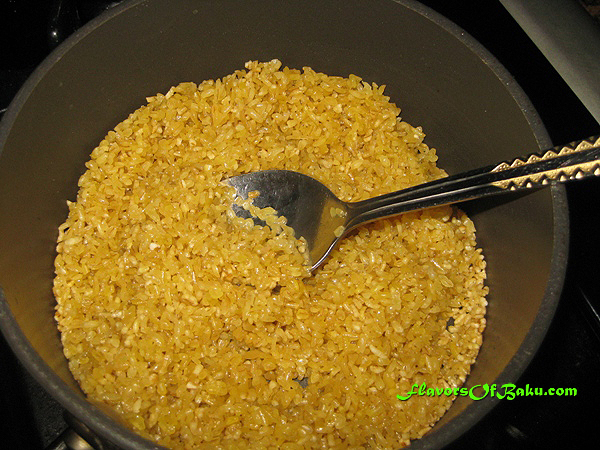 Wash and drain one cup of bulgur. 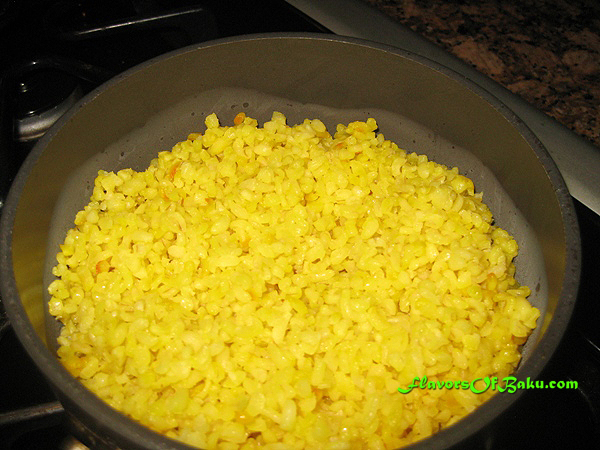 In a medium-sized saucepan, melt clarified butter (or olive oil) and sauté the bulgur for about one minute over medium heat. Pour 2 cups of lamb broth through a strainer with fine mesh into the saucepan containing the bulgur. 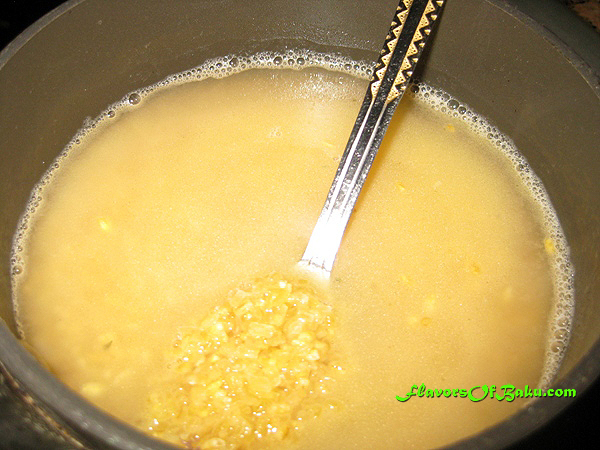 Cover the saucepan with a lid and simmer over low heat until the liquid evaporates and the bulgur is cooked. 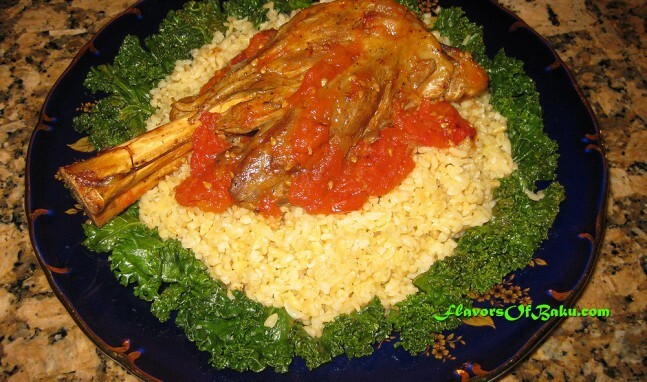 Serve hot on individual plates by placing the lamb over the bulgur and pouring the tomato sauce on the top.